Pssst! Hey, did you know there is other stuff going on in the Real Housewives of Beverly Hills world that isn’t drilled into our minds filmed? Well, there is. And thankfully the words “puppy” and “gate” are not even uttered. Oops. Erika Jayne’s husband, Tom Girardi, has been involved in a $15 million dollar lawsuit. And recently there has been an update that is sure to make Erika, and her paid glam squad friends, happy. According to an article in The Blast, a judge agreed that the lawsuit against Tom should be “heard in arbitration and not in public court.” I bet Erika is breathing a sigh of relief. 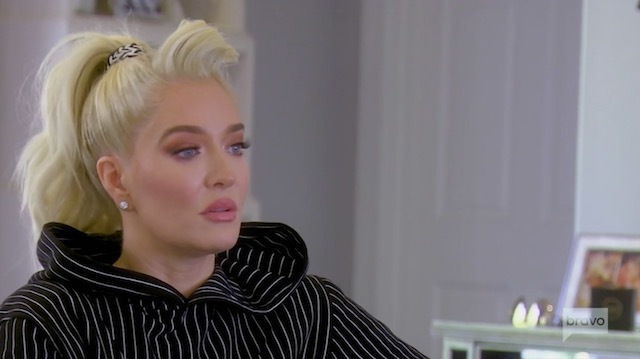 Can you imagine if something other than a puppy adoption gone wrong was a storyline on this season on RHOBH? Seriously, how is puppygate the ONLY thing that is being discussed? How about more on PK Kemsley and Dorit Kemsley’s financial problems? Or how about Mauricio Umansky’s own lawsuit? However, they claim he never made a payment towards the loan. Also, they state the money lent was “used to maintain [his] lavish lifestyle and to keep his prominent law firm financially afloat.” Is this how Erkia is paying for her monthly beautifying process? According to the complaint, Tom had agreed to a payment plan, and he had agreed to use his mausoleum home as collateral. Maybe Thomas and Erika can move in with Dorit and PK, and they can all share the expenses. Tom claims he is not in violation of the agreement. And he has “not taken one penny from the law firm in the past three years.” According to him, an agreement was reached to pay the money “in approximately two weeks before the lawsuit.” He also adamantly denies the money was spent towards his lavish lifestyle. Personally, I’d rather watch the financial woes of the women who hold themselves out to be extravagantly rich. But what if this entire season was just the creation of none other than the master manipulator herself, Lisa Vanderpump? Lisa creates a scenario which gives her the intro to her possibly new reality series. Kyle Richards, Dorit, and Erika play along because they don’t want their dirty laundry aired. And Lisa Rinna is happy to become the only Lisa on the show. Or maybe this season has just driven me crazy. Anything is possible at this point. TELL US – DO YOU BELIEVE THOMAS? WHAT ARE YOUR THOUGHTS ON THE CASE BEING REMOVED FROM PUBLIC COURT?